Pakistan’s Prime Minister Nawaz Sharif will resign his position immediately following a landmark decision by his country’s Supreme Court. Sharif has been under fire since last year, when leaked documents appeared to show his family had hidden wealth in shell companies overseas. Earlier this month, investigators revealed that crucial financial documents provided by the Sharifs used Microsoft’s Calibri font but were dated from before that font was publicly released. The five-member Supreme Court ruled unanimously on Friday that Sharif was disqualified from holding a public position on the grounds that he’d been “dishonest to Parliament and to the judicial system” according to CNN. 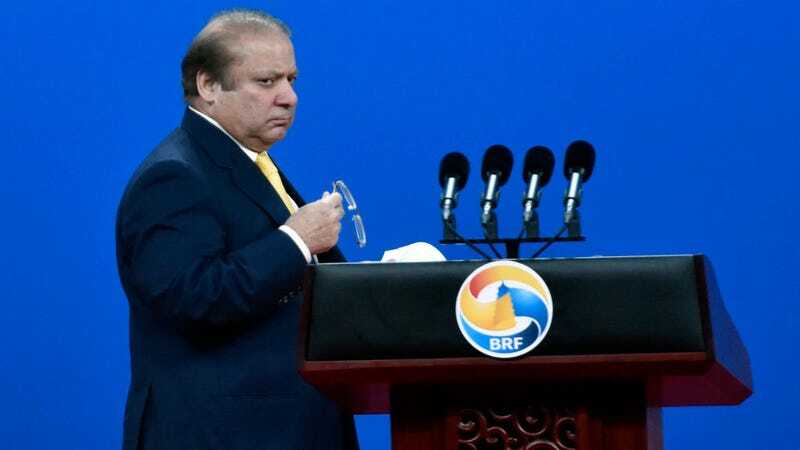 A spokesperson for Sharif’s PMLN party later read a statement that said, “Nawaz Sharif will step down as premier of Pakistan despite reservations regarding the verdict.” The prime minister’s cabinet will also be dissolved. Sharif’s family’s finances first garnered scrutiny following the leak of 11.5 million documents known as the Panama Papers. The allegedly hacked documents identified many powerful people around the world and outlined how they concealed money through shell companies. Sharif was named in the leak and an investigation into the finances of several of his immediate family members followed. The investigation concluded early this month and the final report identified several instances of alleged wrongdoing. But it was the use of Microsoft’s font on a document that was supposed to pre-date Calibri’s existence that served as a focal point, rallying the public to condemn Sharif. His daughter, Maryam Sharif tweeted an image of a disclosure document in November that was dated 2006. When investigators examined the form, they realized that it couldn’t be legitimate because Calibri was released to the public in 2007. Social media users began using #Fontgate as shorthand for all things related to the Sharif family’s corruption. Among the findings, investigators said that Sharif’s children had not disclosed their ownership of three offshore companies that had made deals worth at least $25 million. They also claim that Sharif was the chairman of the board at a company called Capital FZE which is registered in the United Arab Emirates. These things wouldn’t necessarily be illegal in Pakistan, but the family is required to formally declare their involvement. At the time of the revelation that the font couldn’t have been used on Sharif’s daughter’s disclosure form, there was some dispute over the actual date of Calibri’s public availability. That doesn’t seem matter to much anymore.